Burlington, MASS. (January 11, 2019) – Population health management leader Arcadia.io announced their coverage in three major reports from highly-respected third-party analyst KLAS Research, Population Health Management 2018 Part 1 and Part 2 and Value Based Care Managed Services 2018. 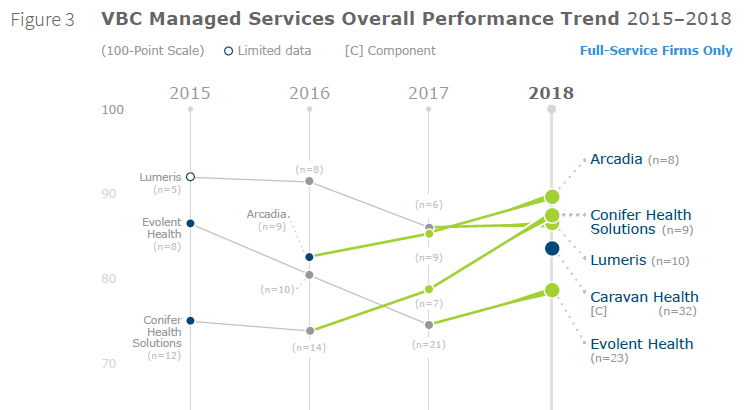 Arcadia scored highest among all full-service value-based care managed services vendors and was the strongest fully-rated population health management vendor for financial outcome success. Figure 1: Financial Outcome Success, fully-rated vendors and vendors with limited data. Data from Figure 1 on Page 4 of Population Health Management 2018, Part 2. Figure 2: Value Based Care Managed Services Overall Performance Trend, 2015-2018, fully rated and limited data full-service vendors. Data from Figure 3 on Page 5 of Value Based Care Managed Services, 2018. KLAS found that, “provider organizations have realized that to be successful with value-based care, they need their vendor to go beyond being a great partner to providing additional guidance and expertise in four key areas: strategy, product optimization, ongoing benchmarking/performance assessment, and VBR contract assessment.” Arcadia scored the highest among fully-rated vendors for its ability to provide strategic guidance to healthcare organizations using its platform Arcadia Analytics. Strong population-level analytics are critical to developing an effective value based care strategy. A key part of executing that strategy means an organization needs to influence providers working with individual patients – by providing trusted, actionable insights at the point of care. Arcadia’s proprietary process and technology for clinical data integration ensures high quality data through the use of machine learning, built on the largest clinical training dictionary leveraging a decade of experience, and data from 1000s of disparate EHRs and 50M patient records. This ensures that physicians trust and use data from the Arcadia Analytics enterprise clinical data asset. To reduce provider abrasion, in addition to the user-centered design of its core web portal, Arcadia Analytics offers a contextual, interface-free, EHR-aware application that presents a provider with population health insights when the patient’s record is opened in the EHR without the provider ever having to change applications or deal with additional logins. For more information, visit arcadia.io. Arcadia.io (www.arcadia.io) is a population health management company, specializing in data aggregation, analytics, and workflow software for value-based care. Our customers achieve financial success in their risk-sharing contracts through Arcadia’s focus on creating the highest quality data asset, pushing expertly derived insights to the point of care, and supporting administrative staff with data when and where they need it with applications including care management and referral management. Arcadia has off-the-shelf integration technology for more than 40 different physical and behavioral health EHR vendors, powered by machine learning that combs through variations in over 50 million longitudinal patient records across clinical, claims and operational data sources. Arcadia software and outsourced ACO services are trusted by some of the largest risk-bearing health systems and health plans in the country to improve the bottom line. Founded in 2002, Arcadia is headquartered outside Boston in Burlington, MA, with offices in Seattle, Pittsburgh, and outside Chicago in Rockford, IL. Population Health Management 2018, Part 2, Page 16. Value Based Care Managed Services 2018, Page 15. Population Health Management, Part 1, 2018, Page 22. Population Health Management, Part 2, 2018, Page 16.